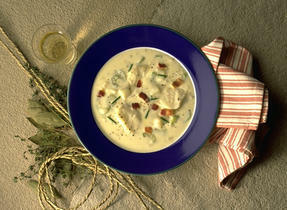 A comforting and delicious soup. Caraway isn't a common recipe ingredient, but it is indeed very delicious. 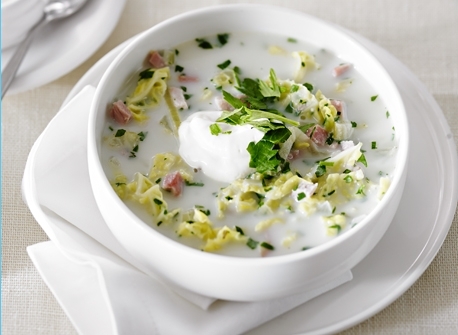 It enhances the flavour of cabbage and ham. In a large saucepan, sweat the onion and cabbage in the butter over low heat. Season with salt and pepper and add the mustard seed and caraway seed. Cover and cook for approximately 8 minutes and stir occasionally until the cabbage wilts. Add the remaining vegetables, ham, bay leaf, broth. Bring to a boil and then lower the heat to minimum. Cover and simmer for 40 minutes. Add the milk and cook 5 minutes without boiling. Serve with sour cream. Sprinkle with parsley and celery leaves. 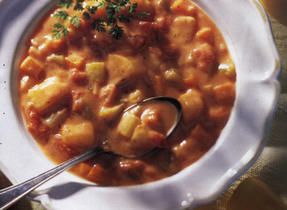 Get a head start: This soup can be made and refrigerated up to 5 days ahead of time. Practical tips: You will need approximately 5 oz. (150 g) of ham to make 1 cup (250 mL). Freeze individual servings of soup for a quick lunch option. Turn the soup into a meal by doubling the amount of ham. When using a slow cooker, follow the recipe instructions and then cook on low for 4 hours. Replace the caraway with cumin, fennel or juniper.